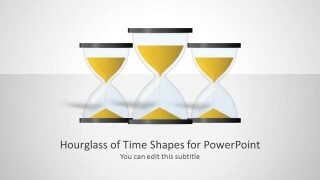 Discuss time and project management using the template Hourglass of Time Shapes for PowerPoint. Hourglasses have been used to measure time since the 14th century. One can measure the time by the amount of sand that has passed from the top part of the hourglass, to its bottom. When all of the sand is found at the bottom, it means that time has run out. 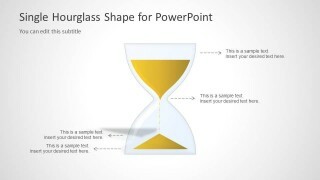 Demonstrate different periods with the hourglass PowerPoint graphics. 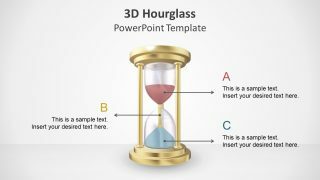 Apply the hourglass concept to project reports and analysis. 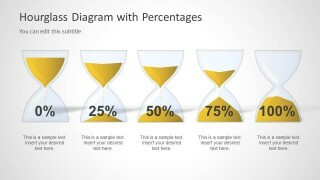 The graphics help portray a relative view of time, by comparing time spent against remaining time. The design is flexible and easy to adapt. Any alteration regarding color and size will not affect the graphic resolution. 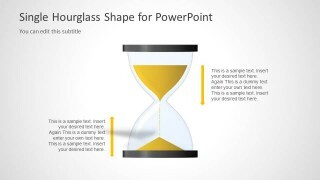 All slides of the PowerPoint template contain the hourglass graphic. The first slide features three hourglass shapes, with two flanking a middle one. 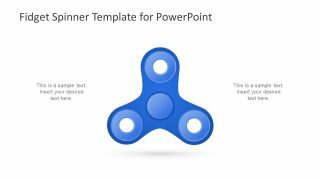 This acts as a cover slide and is appropriate in time management presentations. 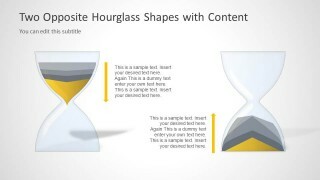 The second slide compares the top and bottom halves of the hourglass. Arrows, placed next to each half, direct the flow of the sand in the hourglass. Text placeholders beside the arrows can have the relevant descriptions. Any alteration regarding color and size will not affect the graphic resolution. A plain hourglass on the third slide has four arrows pointing to text placeholders. The arrows are located in key locations of the hourglass. These can signify the budgeted time, the start of the project, its implementation, and its end. 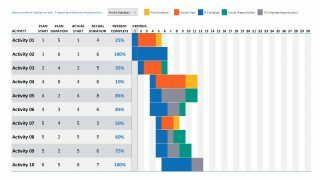 The presenter can provide progress reports for each interval. 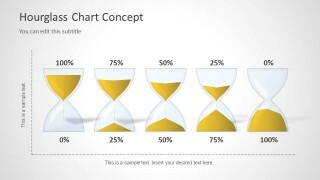 The fourth and sixth slides in the Office template contain five hourglass shapes. Each of the hourglasses represents a certain time. For example, the first hourglass, which shows the top half at 100%, indicates that the project has not yet begun. 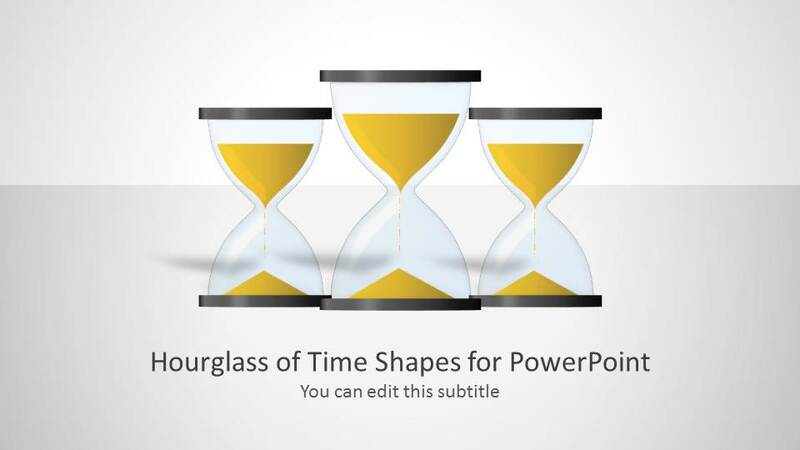 Create various time-based reports using the Hourglass of Time Shapes for PowerPoint. 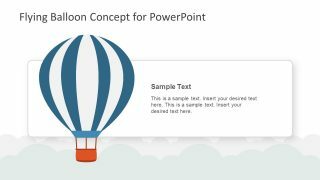 Make suggestions and revisions to improve time management using the PowerPoint template.